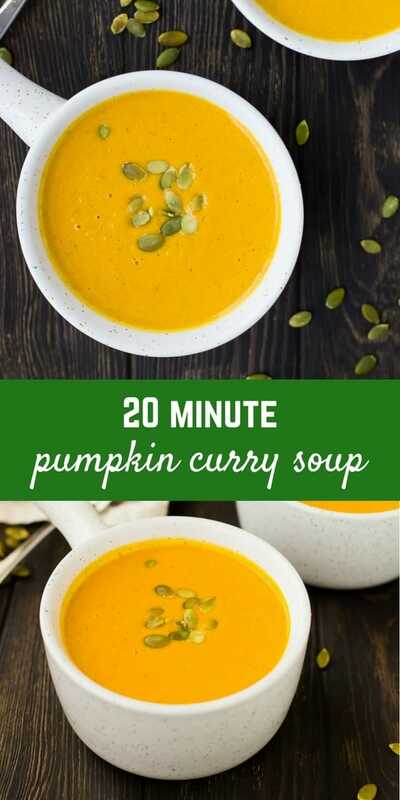 Warm yourself from the inside out with this easy pumpkin curry soup. You’ll love how quick and easy it is to make and you’ll find this to be a new go-to recipe! Fall is in full effect despite the last couple weeks in Michigan being unseasonably warm. I’m not complaining, even though our grass is dying from the lack of rain. We have a line straight down our property. One side is green, one side is brown. We don’t have underground sprinkling on all 3.5 acres so the poor outer edges have been suffering. Not to worry though, we live in Michigan. Next week it will probably all be covered in snow. I heard this winter is going to be full of heavy snowfalls (say it isn’t so!!!). I’ve already been making calls to find a new company to plow our street. I can’t believe that time has arrived already! In the meantime, I’ll enjoy this strange fall and ignore the lawn. I’m currently making my way through P90 workouts (if any of you have done this series of workouts, I just switched from A to B and I am dying) and I glanced at the food recommendations and recipes. Included was a pumpkin soup. I changed a lot about it, but it was the inspiration for this healthy and cozy soup. I really love how this soup turned out, and when you use canned pumpkin, it really couldn’t be easier. To season this soup, I opted to use my homemade curry seasoning but you could definitely use a storebought blend as well. Other than the curry, you’ll find your basics: garlic, onion, celery. I made it creamy with Greek yogurt because it’s what I always have in the fridge but you could also use coconut milk or sour cream. Keep in mind that smoothing it out with milk instead of yogurt will yield a thinner soup, so you may want to start with a lesser amount than what is called for in the recipe. 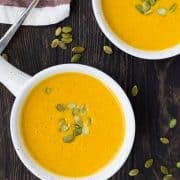 Tip: If you’re used to things being a little more on the sweet side, you’ll probably want to sweeten this pumpkin curry soup with a touch of honey. Give it a taste and make it your own! 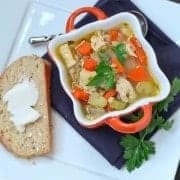 This soup freezes well – I often freeze it in one serving portions so I can pull one out when I’m craving something warm and cozy. Tip: To make vegan, use coconut milk instead of Greek yogurt and use a vegan sweetener like agave. ….or you can check out my entire collection of soup recipes! 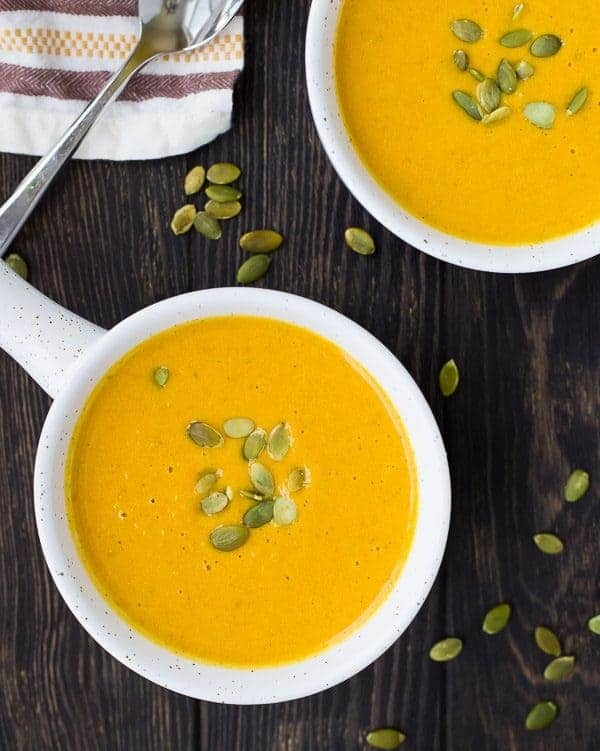 Warm yourself from the inside out with this easy pumpkin curry soup. You’ll love how quick and easy it is to make – you’ll be making it time and time again! In a medium saucepan, heat oil over medium heat. Add onion, celery, and salt, and cook, stirring, for about 5 minutes or until onions are translucent and celery is softened. Add garlic and cook for another minute, stirring, until garlic is fragrant. Add curry powder and cook for another minute, stirring, to toast spices. Stir in broth and pumpkin and cook until simmering. Remove from heat and CAREFULLY blend using an immersion blender. Slowly stir in yogurt. If needed, heat again over low heat to warm through. 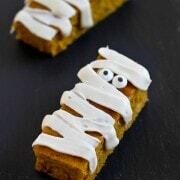 Garnish with pumpkin seeds if desired. 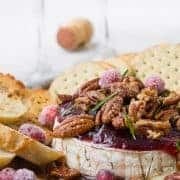 Serving note: This would be fantastic topped with homemade croutons. Verdict: I love this pumpkin curry soup! It’s a good alternative to squash soup, which I always eat a lot of in the fall and winter. Husband’s take: Ben isn’t a curry fan so he didn’t even give this one a try. His loss! Changes I would make: None are necessary but make sure to give it a taste and add sweetener or salt and pepper to make it perfect for you!